Tonight was Back to School night at Caroline's school so Jason and I made our way over to SES at 6:30. (Our first back to school night! Should we have had our picture taken??) My parents agreed weeks ago to babysit so we could go without them. It seems we were some of the only parents there without our kids though. Although, at least the ones that came with children, came at all. In Caroline's class of 19, about 5-6 sets of parents were there, which is kind of sad if you think about it. Kindergarten is when you're the freshest, but then, I'm sure some parents had to work, have had kids go through kindergarten recently (not that they still shouldn't have been there), or some other reason. But, having so few parents there worked out well for us. After she went over the plans for the school year and answered some questions from the group, most parents left but Jason and I hung around and got to ask a bunch more questions and just chat with Ms. R a little more. It was funny to hear her talk about things they had done that day and to find out what Caroline had told us was pretty accurate. (Wow, the novelty!) Before we left, we wrote Caroline a note on a big heart the teacher had laid out for just this purpose and left it in her cubbie for tomorrow morning. 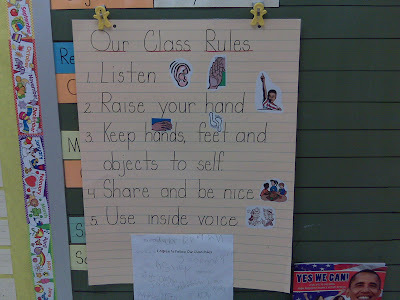 I love her teacher already...first rule to a successful year---students must take ownership of the rules! And Ben was read that monster book! LOL! I'll bet C is hearing Miss Bindergarten this week too... LOL! What the heck are dibels? Please tip me off for next year! I'm educationally challenged right now. @Heather - Caroline's name was at the bottom of the signed sheet - I guess I cut it out by mistake. @ Katie: Dibels are Dynamic Indicators of Basic Early Literacy Skills and they are used to help assess how well kids are moving along into the reading process. They are kind of like little games for the kids.